DeKalb County was established in 1823, and in the first fifty years of the county's history, all schools were private, although they did receive some monies from the state. The first school was DeKalb Academy, established in 1825. In 1838, Stone Mountain Academy opened. A system of free public schools did not become a reality in Georgia until the late nineteenth century. Public education in DeKalb began after the Civil War, in 1873, when DeKalb citizens raised $4,200 to open public schools. 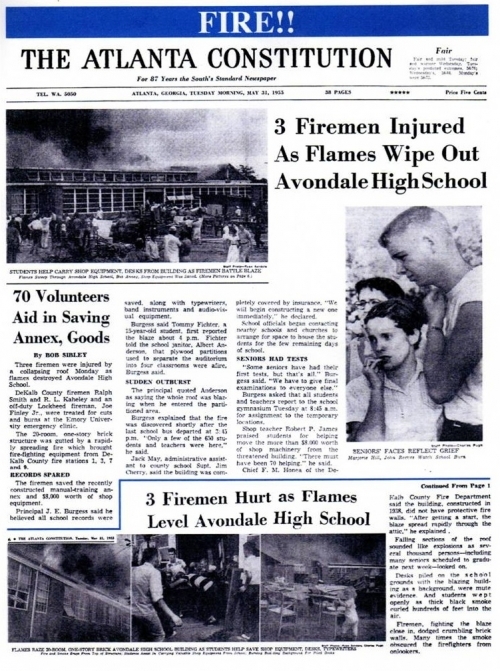 The fire took place in May, 1954, (as I remember) just about graduation time. Louise Kutsche and I walked up there from our homes (ours was 14 Avondale Plaza (Dewey Brown bought it from my folks), and watched it burn, looking on in horror as so many great times were experienced there. The graduation pictures of our class was saved, I was told later, but I don't know for sure. Bill Anderson used to bring his guitar to school & play for us at lunch. (we wondered about it then, but now we know the "rest of the story". Those were great days we had while preparing ourselves for the rest of our lives---and we didn't realize how great those days really were! Great times at a great place!! Valerie Bishop - We ran up there (I was with Bonda Brown) , and stood around as little kids watching the teenagers crying, and throwing typewriters out the windows. Then they had classes to finish the school year out under the trees and at the old stadium.